"The ceremony, held before an invited audience of renowned academics, however, was not with-out a whiff of scandal. Reliable sources close to the Awards Committee hinted to journalist that 'undue influence’ had been brought to bear concerning the decision to award the prize to Dr. Legrange. After the award, Dr. Legrange was not available for comment, but an unofficial spokesperson for allegations were 'unfounded, and not worthy of serious consideration'. "The ceremony itself was one to be broadcast to several worlds, but transmissions were marred by technical problems. Dr. Legrange departed from his published text and delivered an emotional attack on the Vrusk authorities of Kraatar. He spoke in particular of their 'ruthless exploitations of the human population'. Unfortunately, a power failure interrupted further broadcasts. "We'll be back right after the break with the latest news on the Cassidine Zero-g ball game. 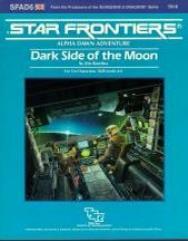 But now, a word from our sponsor..."
Dark Side of the Moon is a fast moving investigative adventure for use with STAR FRONTIERS game and can only be played with those rules.